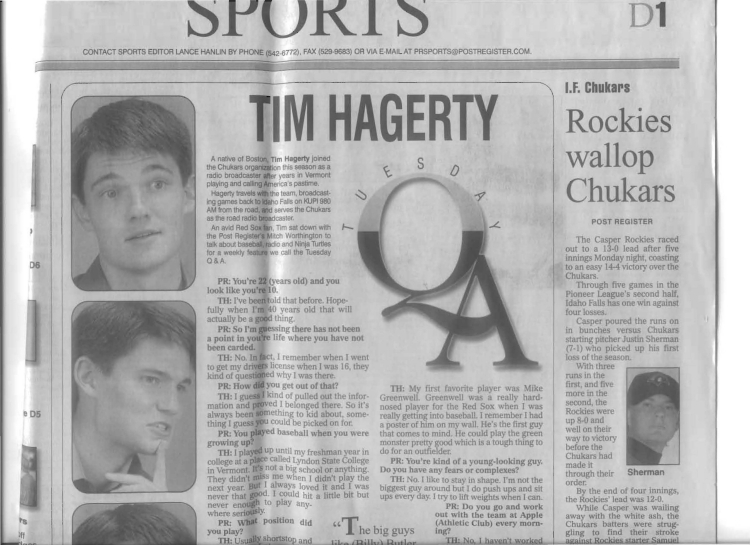 Tim Hagerty is the broadcaster for the El Paso Chihuahuas (Padres Triple-A affiliate). Before El Paso, Tim broadcasted for the Padres Triple-A club in Tucson, Ariz. and Portland, Ore. His was also previously the voice of the Double-A Mobile BayBears (Padres affiliate) and Rookie-level Idaho Falls Chukars (Royals affiliate). While with the Royals affiliate, Tim made his MLB play-by-play debut, joining Kansas City's radio team for a game against Tampa Bay. In 2007, he produced and hosted the Diamondbacks Minor League Report on the D-backs Radio Network. In the off-season, Tim is a freelance reporter for Fox Sports Radio and Sporting News Radio, providing national, on-air updates from college football and basketball games. The Canton, Mass. native was selected to broadcast a Triple-A All-Star Game and Triple-A National Championship Game on Westwood One and has called two MLB exhibition games. His sports broadcasting work has been honored with both national and regional Edward R. Murrow awards and by the Alabama Associated Press, Mobile Press Club, Idaho State Broadcasters Association, Idaho Press Club, Vermont Associated Press and Society of Professional Journalists. Tim was voted El Paso Sportscaster of the Year in 2014, 2015 and 2016. Baseball America named him an MLB broadcast prospect in its 2016 Best of the Minors feature.